Philippines President Benigno Aquino has warned a clan leader that he must end a stand-off involving armed supporters who are occupying a remote part of Malaysia's Sabah province. In a TV address, Mr Aquino said Sultan Jamalul Kiram III would face the "full force of the law" if the men were not withdrawn from Lahad Datu, on Borneo. Some 180 people travelled by boat to the district earlier this month. They were aiming to fortify the sultan's historical claim to the land. Calling themselves the Royal Army of Sulu, and about 30 of them carrying arms, they had set up camp on the small area of disputed territory, but were soon surrounded by Malaysian police. "If you choose not to co-operate, the full force of the laws of the state will be used to achieve justice for all who have been put in harm's way," Mr Aquino told the sultan in his statement. "This is a situation that cannot persist. If you are truly the leader of your people, you should be one with us in ordering your followers to return home peacefully." He also warned that an investigation was under way into whether any laws had been broken in this "foolhardy act". 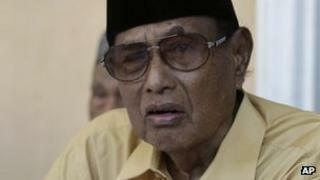 However the sultan's younger brother, Agbinuddin Kiram - who is with the group - said they had not violated any laws as "Sabah is owned by the Sultan of Sulu". "We're not invading this place because it is ours,'' he told the Associated Press, but said that they were running out of food. He added: "If the Malaysian police come with guns, we have to defend ourselves." Malaysia and the Philippines have agreed the stand-off will be settled peacefully. The Philippines has sent a navy ship to the region, carrying food and medical supplies and also social workers and Muslim leaders, in the hope of persuading the sultan's supporters to abandon their goal. Malaysia's Sabah state shares a sea border with the southern Philippines, which is home to a number of Islamic militant and kidnap-for ransom groups. The journey between the two can take only a few hours. It formed part of the Sulu Sultanate - which once spread over several southern Philippine islands as well as parts of Borneo - before it was designated a British protectorate in the 1800s.